GUARANTEED 100% LEAK PROOF – Our new and innovative easy twist closure lid and cap technology ensure that your protein shaker shuts safely and securely every time. Not only is the twist action smooth and easy to assemble & disassemble, but it is guaranteed leak proof. Perfect for keeping your gym bag free from any accidental leaks or spillages. SMOOTH LUMP FREE SHAKES EVERYTIME – Each Pukka Protein Shaker comes complete with a unique and specially designed easy mix insert. This insert features an effective cone shaped design to increase the flow of liquid when shaken, helping to produce the perfect lump free protein shake every time. HIGHEST QUALITY & BPA FREE – Our non-toxic BPA & DEHP free protein shaker bottles are made in Europe with the finest quality food industry approved plastic. The quality is so good, they are suitable for the Freezer, Dishwasher & even Microwave Safe. 2 x DETACHABLE STORAGE COMPARTMENTS & PILL SEPARATOR – Our versatile protein shaker with storage is the perfect alternative to an electric blender. Storage compartment number 1 has a 150ml capacity and contains an optional pill separator, ideal for health supplements, nutritional snacks or if removed perfect for your pre-workout powder. Storage compartment number 2 has a capacity of 200ml and could be used to store cereals, or your daily choice of protein powder. PUKKA PROTEIN MULTI-BUY DISCOUNTS – Now you can save money on all of our high quality products simply by adding 2 or more items to your basket. Why not treat yourself to a delicious diet whey protein to save up to 15% today. Whether you are a serious Athlete, Bodybuilder, Gym Goer, Crossfitter or simply following a calorie controlled diet such as Juice Plus or the 5:2 Diet, then this is the shaker bottle for you. 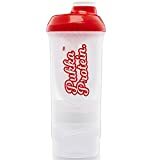 Pukka Protein Shaker Bottle With Storage Compartments – Large 500ml Protein Shaker with Storage + Pill Separator. 150ml Storage Compartment Number 1 with optional pill separator, ideal for supplements or pre-workout powder. 200ml Storage Compartment Number 2. Perfect for cereals or your daily choice of protein powder. Easy Twist Lid & Cap Technology – Guaranteed Leak Proof. Uniquely Designed Easy Mix Insert – Smooth & Lump Free Shakes Every Time. BPA & DEHP Free Food Industry Approved Plastic – Non Toxic For Your Piece Of Mind. 700ml Capacity – With graded scale in oz and ml up to 500ml. Q– Will my Pukka Protein Shaker leak? that your shaker is 100% leak proof. Q – Will this shaker bottle leave lumps in my protein shake? A – No. Each Pukka Protein Shaker comes complete with a unique and specially designed easy mix insert. producing the perfect lump free shake every time. Q – Does the Pukka Protein Shaker come with a mixing ball? A – No. Our unique easy mix insert works better than a mixing ball is not as easy to loose and easier to clean. Q – Who are your Protein Shakers suitable for? or simply following a calorie controlled diet such as Juice Plus or the 5:2 Diet, then this is the shaker bottle for you. Add 2 or more Pukka Protein products to your basket to enjoy our multi-buy discounts (see promotional codes at the top of the page.